The goal of this project is to develop a Sensate floor made from networked sensor tiles, each of which has circa a dozen small pressure sensors connected to an embedded computer. The processors on all tiles are networked when the tiles are snapped together. Local communication between tiles establishes an ad-hoc network. 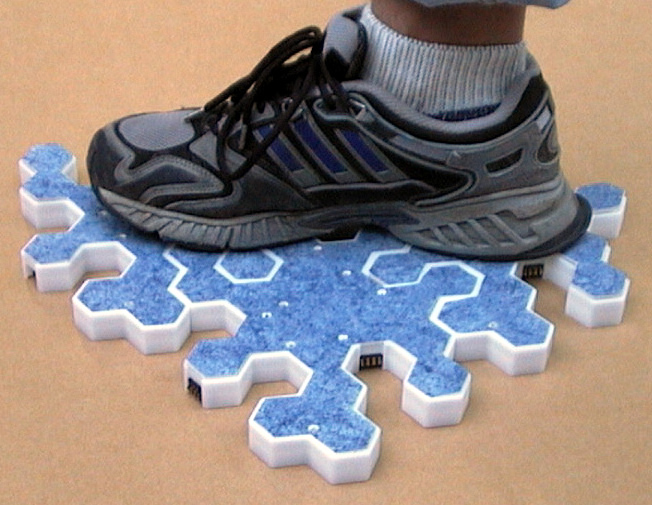 Sensor signals are compared across tiles, enabling stimuli from dynamic sources, such as footsteps, to be clustered and abstracted into a basic set of parameters, which are routed peer-peer across connected tiles to an external computer. This project has applications in smart homes (e.g., people tracking, gait identification), health care (e.g., diagnosis of illness from gait changes), and entertainment (e.g., interactive dance and installation art). This project is a collaboration between Joe Paradiso and Josh Lifton of the Responsive Environments Group and Mikael Fernstrom and his group at the Interaction Design Center at the University of Limerick in Ireland, where this project is based (see their site for more details). This project was spawned via our mutual interest in sensate floors (e.g., the Magic Carpet and LiteFoot projects) and dense sensor networks, and has been fostered through the MediaLabEurope in Dublin. Here is a photo of an old floor tile under test, containing several "prexel" pressure sensors back when they were made out of custom-mixed silicone rubber. Here is a photo of several of the new self-tiling tiles assembled together. Here is a photo showing several of the modern tiles stacked up and awaiting floor assembly. Here is a photo of the Limerick crew (Krispin Leydon, Enrique Franco, and Bruce Richardson) with the tiles that they brought to a demo at MIT from Limerick. 'ForSe FIElds' - Force Sensors for Interactive Environments, McElligott, L., Dillon, M., Leydon, K., Richardson, B., Fernstrom, M., Paradiso, J.A., in G. Borriello and L.E. Holmquist (Eds. ): UbiComp 2002, LNCS 2498, Springer-Verlag Berlin Heidelberg, October 2002, pp. 168-175. Z-Tiles: Building Blocks for Modular, Pressure-Sensing Floorspaces, Richardson, B., Leydon, K., Fernstrom, M., and Paradiso, J.A., in the Proc. of the ACM Conference on Human Factors and Computing Systems (CHI 2004), Extended Abstracts, Vienna, Austria, April 27-29, 2004, pp. 1529-1532.